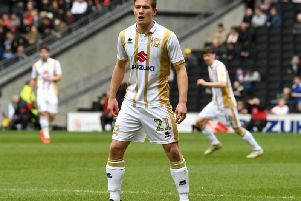 MK Dons will look to consolidate top spot when they return to action this Saturday, taking on Carlisle United at Stadium MK. John Sheridan's side sit 11th in League 2 heading to Stadium MK, but the Cumbrians are proving a real handful on the road this term, picking up 17 points from a possible 30 away from Brunton Park. Carlisle have an excellent record against Dons down the years, though the sides have not crossed paths since January 2014. Winning seven of the 12 meetings, Carlisle have won on three of their six trips to Stadium MK. Dons however remain undefeated at Stadium MK in League 2, and head into the game on top of the table. Manager Paul Tisdale however is wary of Carlisle's threats. "John Sheridan is an experienced manager, and he was a fabulous footballer," said the Dons boss. "They're one of the best travelling teams for points gained. It's more than likely to he a very tough games. "If after 10 games away, they've picked up 17, 18 points, that's not a fluke. There is always a player or two in the opposition who can do something, there are players in there we like the look of, but we need to be on our guard." After being knocked out of the FA Cup in the opening round to Grimsby, Dons enjoyed a weekend without a fixture. Tisdale said: "We always try and take advantage of the circumstances. We've had a chance to take a mental break, more than a physical one. To have a few days away from that decision making has been a real relief. "It was nice to beat Morecambe,to enjoy it off the back of a win. But we're ready now for what will be a long and important six games through Christmas and into the New Year." Defender Baily Cargill added: "It gives us a chance to get out onto the training pitch and gives us a chance to improve, which is nice, but it feels like ages since we've played so can't wait for Saturday! It's another good thing, we're all raring to go now, having missed a game. We're all looking forward for the next one." Dons are still sweating on the fitness of Jordan Moore-Taylor and Chuks Aneke, both of whom limped out of the game with Morecambe but could have Peter Pawlett at their disposal. Tisdale added: "Jordan's a bit sore, and having the weekend off was a plus for him and Chuks. As always, we will assess them closer to the game to see what is possible and what's not. I'd like them both back as quick as I can. "Peter's closer to being fit and available. He had a minor injury since coming back from his ankle problem. He's close and hopefully we can assess him before Saturday. He has been training, he has been looking sharp and I'm hopeful he will be available."